A group of runners have taken on a seemingly insurmountable mission: to run 100km within the city of Metro Manila. Call them crazy if you wish, but nothing will stop them from accomplishing this challenge as its cause is something they are willing to sweat, pant, cry, and struggle for. 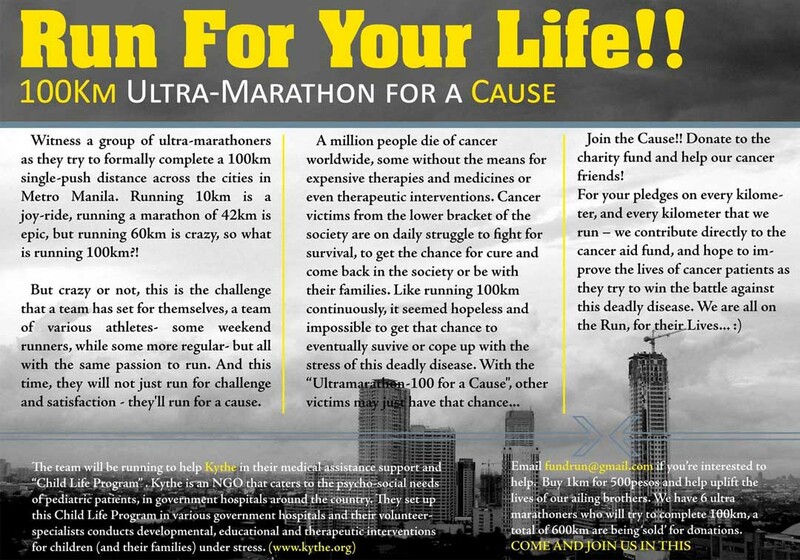 They are running to raise funds for cancer patients. If you wish to help (without breaking a sweat), you can pledge a certain amount for every kilometer that these honorable ultra-marathoners will run. For those curious about the run, it will be held on July 21 to 22, 2007. Other details will be released within this week. For more info, you may email Neville Manaois at fundrun@gmail.com. Thanks to Anton for sharing this! Plus, a chance to win P250K! Boy, I would love to get my hands on any of those. Why oh why is Rogin-E only for men?! By the way, if you by any chance win the cash, the tracking system in The Bull Runner’s blog shall automatically deduct a 20% referral fee through your online bank account. Thank you in advance for the commission.